Today we re-post the first in an Acadiensis series that features students from Jerry Bannister’s undergraduate and graduate Canadian Studies and History classes at Dalhousie University. 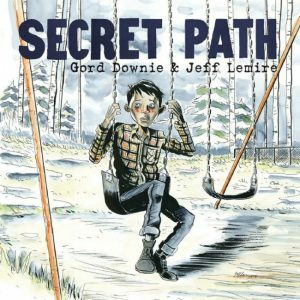 Canadians following the news lately could probably say something about The Tragically Hip’s ailing frontman, Gord Downie, and his most recent artistic endeavor, The Secret Path. The conceptual album, paired with a graphic novel designed by artist Jeff Lemire, tells the story of Chanie Wenjack, an Anishinaabe child who froze to death trying to escape his Northern Ontario residential school in 1966. Reactions to the album, to the CBC special which broadcast the live performance of The Secret Path, and to the accompanying documentary film have been generally positive. Many see it as a continuation of the efforts of the Truth and Reconciliation Commission (TRC), whose mandate to collect and tell the stories of Indian Residential School (IRS) survivors ended with the release of their final report in June, 2015. Downie has been praised for his dedication to indigenous rights, and for once Canadians are participating in a dialogue about a once neglected history, acknowledging the horrors indigenous people in Canada have faced for centuries. This is a good thing. We need sustained conversations about IRS in the public sphere; we need them in the government. In this regard, the TRC has been crucial to ensuring that Canada does not forget this history, as has the work of Gord Downie and others like him. The history is important, the people dedicating their time to spread this knowledge are indispensable to the reconciliation movement, but Canada is only looking at a history, past tense, and that serves as a cause for worry. It appears that our satisfaction with these endeavors leaves us content with merely recognizing a tragic story. The real work — asking tough questions of ourselves and taking action to combat the legacy of these institutions and the existence of the systems that allowed the schools to flourish in the first place—goes undone. The TRC was, and still is, key to facilitating reconciliation in Canada, but we place too much weight on its existence as an example of our success in mending the relationship between Indigenous and non-Indigenous Canadians. We are content to watch The Secret Path on TV, with reading stories about survivors on the CBC, with praising school boards for including the history of residential schools in their curricula. The issue with this is that the TRC was only meant to be the beginning of a much larger and more difficult task than merely collecting historical evidence. The late Roger Simon rightly worried in an article published in Reconciling Canada that in the months following the beginning of the TRC’s mandate Canadians would see the material the Commission generated and do nothing with it. This seems hard to believe, especially with the success of Downie’s work, and of books like Richard Wagamese’s Indian Horse and Joseph Boyden’s Wenjack on a national level. When we look at what we have achieved, however, in terms of indigenous rights, it’s clear that we have a long way to go. The most tangible legacy of the TRC comes in the form of its ninety-four Calls to Action, designed to hold government and various other organizations accountable for continuing reconciliation work in Canada. The recommendations are meant to acknowledge and remedy the systemic racism and oppression that Indigenous people have been subjected to since before Confederation. Now, if we were to take the calls to action as a rubric for successful reconciliation, Canada would receive a failing grade. In the past few weeks, overshadowed by broadcasts of The Secret Path, the Liberal Government has been chastised for under-funding Indigenous child welfare, something that continues to contribute to many issues within Indigenous communities today. Reserves country-wide are experiencing record youth suicide rates; many of these victims are children as young as thirteen. Perhaps most telling of the situation in Canada is that despite ratifying The United Nations Declaration on the Rights of Indigenous Peoples (UNDRIP), the government has dragged its feet when challenged to actually implement it. Justice Minister Jody Wilson-Raybould explained in response to criticisms from indigenous leaders, that “with respect to the UNDRIP, it is important to appreciate how it cannot be simply incorporated, word for word, into Canadian law.” We keep talking about history, but our focus on that history neglects the fact that much of what we see as part of a dark past is occurring right now. The IRS system has ended, but we continue to perpetuate its effects through different means. The unfortunate thing is, because there is now access to this information, we can no longer use ignorance as an excuse for inaction. Yet, as Simon anticipated, because we consume media and educational material designed to bring the history of residential schools to light, many mistake acting for simply taking the time to listen to testimonies. We are either unaware of, or too afraid to acknowledge our own role in the system that created residential schools, a system that continues to put Indigenous people at a distinct disadvantage. Exploring IRS in the historical past is a safe way to confront Indigenous issues; we can read about them and pity survivors of assimilation policy, but not have to confront how Canada is allowing a generation of new survivors — of poverty, of abuse, of systemic racism — to grow. As a historian, I increasingly wonder about my own role in the reconciliation movement; I believe that it is my responsibility to identify how what I know about the past can be applied to the present. It’s not that I believe that we should neglect the history of colonial oppression in Canada, but I feel that we should use our understanding of it to inform how we “do reconciliation” now. The history doesn’t matter unless we do something with it. We cannot be content with just knowing IRS happened; until we begin to raise further questions that pull the focus from history to today, society will continue to be satisfied with this illusion of progress, while Indigenous people continue to suffer. The Truth and Reconciliation Commission is necessary, but we need to be careful and make sure that the discussions it generates don’t overshadow current issues. Real reconciliation work requires action beyond just hearing about how Indigenous people were wronged. We must look at how they are wronged. I don’t have concrete solutions to the issue at hand, but what I do know is that it is important that we at least acknowledge that we cannot achieve reconciliation until we recognize that the systems and ideologies we benefit from are the reasons we need it in the first place. Mercedes Peters is a Mi’kmaq graduate student at Dalhousie University. She is currently writing a thesis on the impact of the Indian Act on the identities of Mi’kmaq women in the twentieth century. See Roger Simon, “Towards a Hopeful Practice of Worrying: The Problematics of Listening and the Educative Responsibilities of Canada’s Truth and Reconciliation Commission” in Reconciling Canada: Critical Perspectives on the Culture of Redress, Toronto: University of Toronto Press, 2013.